For the past couple of months I have been posting a ‘word of the day’ using the hashtag #PWOTD on Twitter. Some of the words are merely triggers to allow myself to say something about photography and others pretty much sum up what I want to say in a single word. A few have links to other websites and quite a few link to old blog posts on here in the hope that some of the 250+ postings on here reach a few extra people. After two months it is getting harder and harder to come up with a word every day (OK so I schedule the tweets up to three or four days in advance using Tweetdeck) and I was wondering whether anyone else had any suggestions? If you’d like to see them then search the hashtag #PWOTD or have a look through my Twitter feed @dg28com . I’m probably going to take a break from doing the word of the day over Christmas – partly because I hope that everyone is going to be having a break from social media but mainly because I really hope that I am! Between May 1999 and June 2008 I posted a large number of technique examples on the original http://www.dg28.com taken from my daily work to show how I used light in an era where digital cameras were pretty poor at ISOs over 800 or even 400 in the case of the venerable Kodak DCS520. These days flash is a creative choice rather than a technical necessity but the techniques still stand up. From time to time I re-post one of these old examples just to remind myself how life used to be. This one was first posted fourteen years ago and for a very long time it was amongst my favourite pictures that I had posted. ©Neil Turner/ TSL, November 2000. Arriving at the job is usually the best times to start having ideas about locations for a portrait. Buildings often have features that lend themselves to use in a photograph, and the grounds can be just as inspirational. When I arrived at the Suffolk farmhouse of journalist and author Simon Barnes, he and his wife were busy chasing one of their horses around the yard. 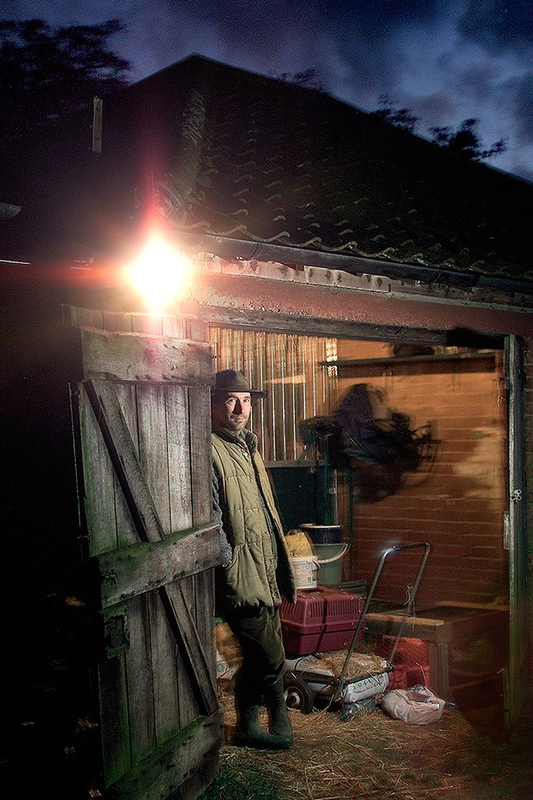 By the time the mare was back in one of the stables it was all but dark, but I had seen just how wonderful the other stable looked lit by the 60 watt bulb inside it. This image called for the mixing of available light and fifty joules of Lumedyne flash. The flash head had it’s diffuser cap over the standard reflector at an angle of 60° from the lens axis and at a height of about six inches above Simon’s eye level. I had to use the flash a lot lower than I would have done because I wanted him to keep his hat on and the if the flash had been higher his face would have been in shadow from it’s wide rim. Cut down to it’s minumum 50 joules at a distance of seven feet the flash reading on 200 ISO was still f6.7, which was a lot more than I would have liked. At f6.7 the inside of the stable needed an exposure of about 1/3rd of a second, and the sky needed 1/2 of a second to get some detail in the lighter areas. The discrepency between the two exposure requirements was only half a stop, so I went with the longer exposure because a little over exposure inside the stable would be fine. With a 28-70 f2.8L series lens on a DCS520 I started shooting pictures of the upper half of his body and a little of the stable roof and sky. Without changing the exposure I changed lenses to the 17-35 f2.8 and moved back. As I moved back the sensor floodlight came on and the light shining into the lens gave some strange pink flare (bottom right) and the floodlight made an excellent element in the composition. By this time I was hand holding the camera at 1/2 second, which meant that there would be some camera shake so I shot about twenty frames at the same exposure in the hope that a few of them would be still enough to work. I shot some safer images as well with the inside of the stable lit by another Lumedyne head complete with a warm up filter to simulate the tungsten glow. The image worked really well, and I am more than happy with it. It shows that light and location are the most important factors when planning a location portrait. Footnote: Immediately after this job I started to carry a sheet of -2 stop neutral density gel in my bag. I have learned lots of lessons the hard way since the beginning of my career in 1986 and, whilst they are fewer and farther between, I still learn plenty of things that way. As photographers we have a vision. We know how we want our photographs to look and we know what kind of response we are trying to encourage from our viewers and from our clients. When we don’t get the reaction that we were looking for or we don’t get any reaction at all then we have either got it wrong or we have a vision so unique that nobody else gets it. 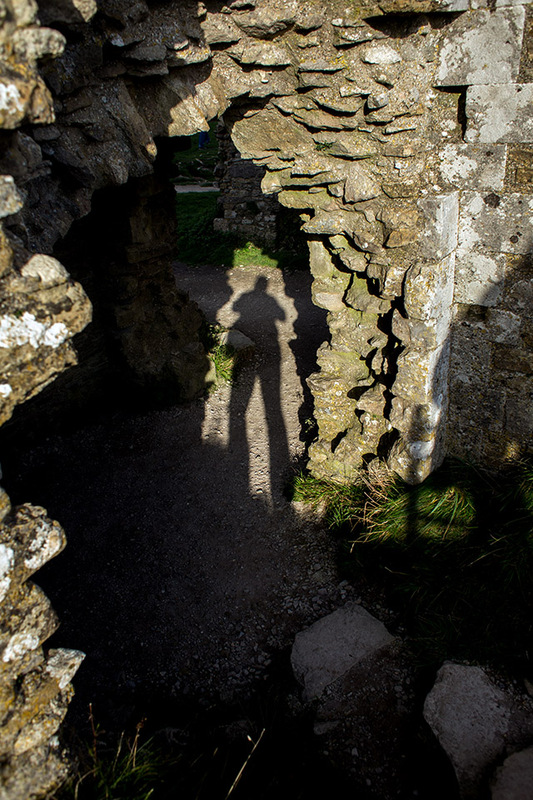 One of the qualities shared by pretty much all of my favourite photographers is the ability to empathise. The best of the best can do it on just about every level too. They understand the feelings and motivations of those that they are photographing every bit as well as they understand those of the target audience. It doesn’t matter if that’s the doting parents of a newborn baby in a studio in the northern hemisphere or the parents of a critically ill child in the southern hemisphere – having the ability to imagine yourself into the position of those whose lives will be effected by your photography is a key skill. I find it hard to think of a genre of photography where empathy wouldn’t be right up there with an understanding of composition or light as a piece of the jigsaw that comes together to make us ‘photographers’. Somebody reading this is gesticulating at their screen and shouting about being single-minded and determined and not letting emotion get in the way of doing a good job and they have a valid point. Having empathy doesn’t always mean that you have to act on it. There will always be situations where you have to put your ability to understand everyone else’s needs and desires to one side and shoot the pictures that you need to shoot in the way that you need to shoot them but the great photographers – even the single-minded great photographers – have empathy. If your are finding it hard to agree with this idea then I’d ask you to look at some pictures and try to work out whose feelings, needs and desires the photographer concerned might have been taking into account and/or ignoring when they shot them. I would hazard a guess that the pictures that have the most impact will be those where empathy is a factor and those that are just eye-candy are those where empathy isn’t a big part of the formula. I was intrigued by a recommendation that I read from a colleague for Tonality. I rarely go outside Adobe Camera RAW these days, even for black and white conversions, but I was tempted to have a go at something new and so I went to the Apple App Store and bought it. After a few attempts at fiddling with it I dismissed it as a very interesting application that I would master one day when I had the time. A few days ago I was asked by a client to convert a lot of images supplied to them as colour Jpegs into mono Jpegs with a slight tone over them. In the past I would have gone straight back to the RAW files and started again but I had the idea of giving Tonality a go. Like so many of the corporate jobs I shoot, the client would rather I didn’t show they images on my personal blog and so I grabbed some other interesting pictures from my ongoing personal work and applied the same sort of presets to them. It had taken me less than five minutes to become familiar with the sliders and controls and probably another five minutes to create the ideal and very subtle split toning effect that the client had been asking for. 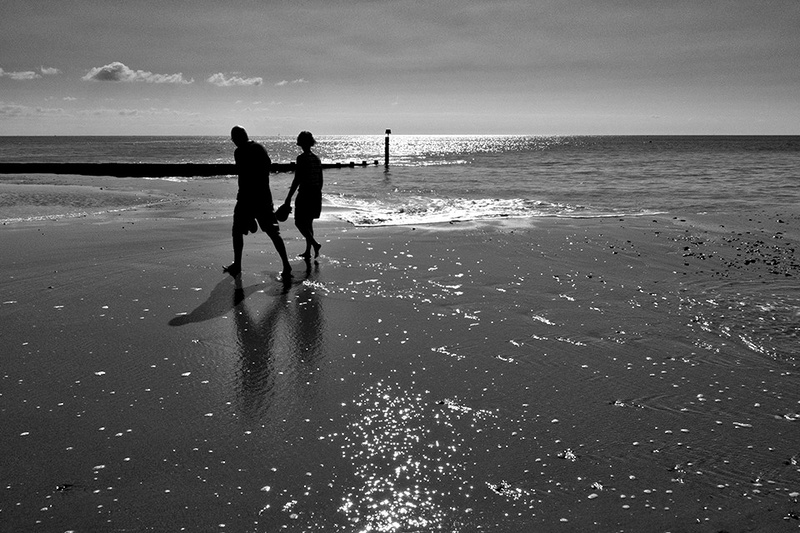 The two versions of a photograph taken on the beach at Bournemouth that you see below were a quick test for this blog post. The colour image is a Jpeg converted from a Fujifilm X20 RAW file in Adobe Camera RAW and the black and white version underneath was converted into black and white using the “adaptive exposure” auto setting in Tonality from that Jpeg. ©Neil Turner, September 2014. Bournemouth. I don’t know what you think but I am really impressed by the job that the auto has done and, whilst I could fiddle and get it even better, I am more than happy with it. I can hear you saying that this is also easy to do in Photoshop (and quite a few other apps and plug-ins) but the point is that it was done in Tonality and it was really easy. The application is capable of a lot of good stuff as well as a lot more completely over the top special effects that I wouldn’t touch with a barge pole. When I get more time, I’m going to get right under the skin of this application. Until then, it will be used on my personal project work. 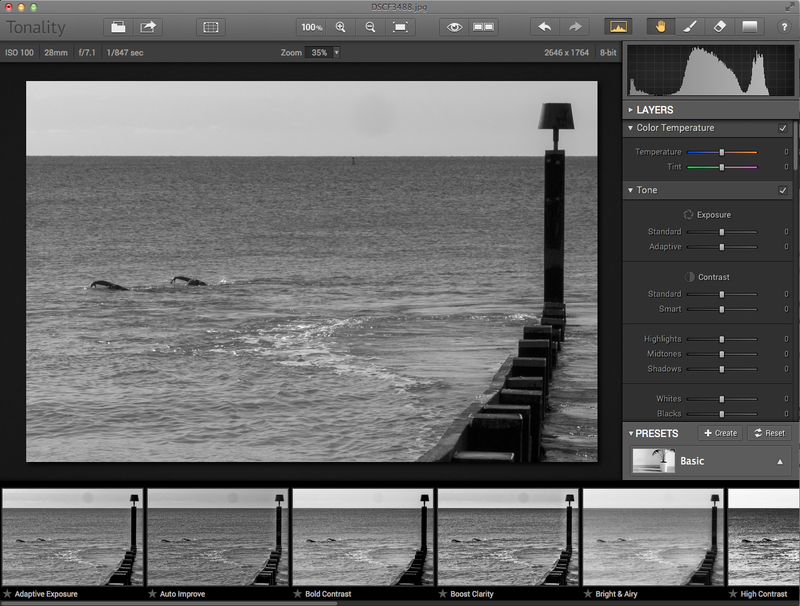 If a client asks for toned mono images again, I will definitely look as using Tonality for that too. The UK price is £13.99 – which is a little bit dearer than most Apps that I would buy just to have a play. It’s a very simple app that achieves its goals.